Gar Smith & friends exposing the ties between militarism & environmental harm! 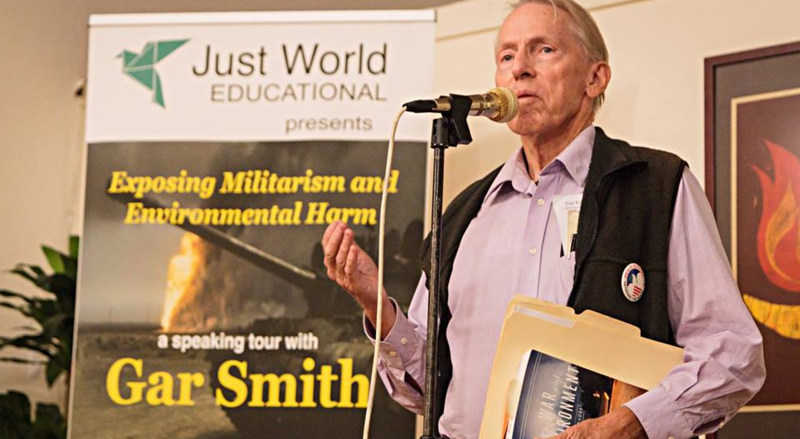 West-coast activist Gar Smith (and his friends) have gotten Just World Ed’s “Exposing Militarism and Environmental Harm” speaker series off to a great start. Braving the wildfires of Northern California, they’ve now held six public forums in that region on this crucial issue. 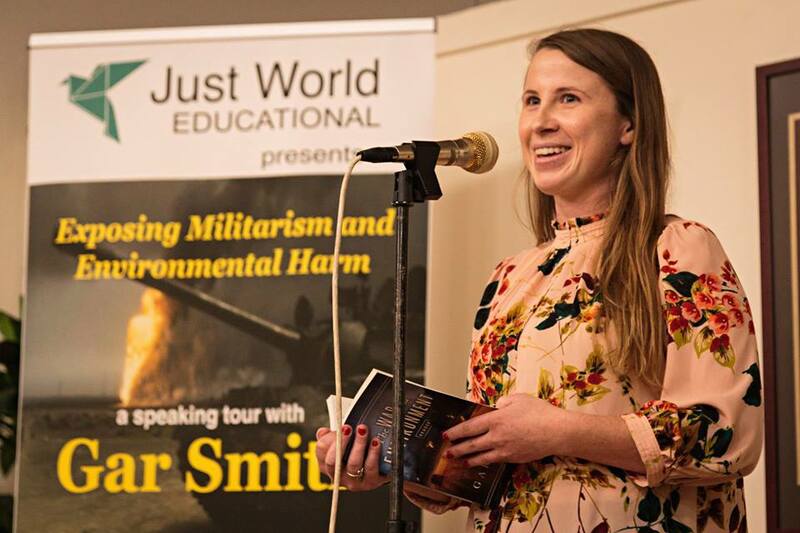 Now, we’re laying plans with Smith to mount a campaign next Earth Day (April 22), to try to inject into as many Earth Day happenings as possible a keen awareness of the fact that–to pack it into our newly-minted hashtag– #WarHurtsEarth. Last week, Smith held the sixth of the forums in the current series at the Mt. Diablo Peace and Justice Center in Contra Costa County. We’re very grateful to Sergio Lub who expertly videotaped the whole event, including the lively discussion that followed Smith’s initial presentation. Lub’s video can be viewed here. 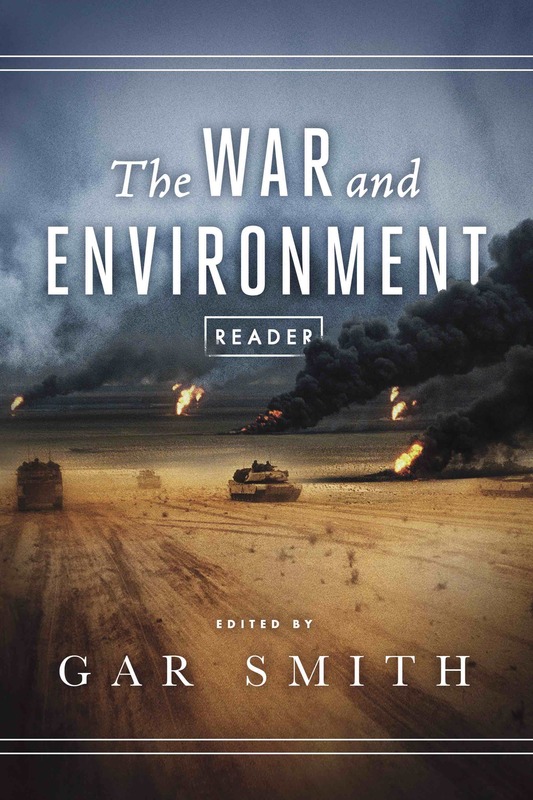 Smith started his reading by sharing several excerpts from his recent anthology, The War and Environment Reader, which was published in October by Just World Books. As is noted in the book, Keju-Johnson dies of breast cancer at 45. But Gar Smith is one of those who is keeping her testimony alive. 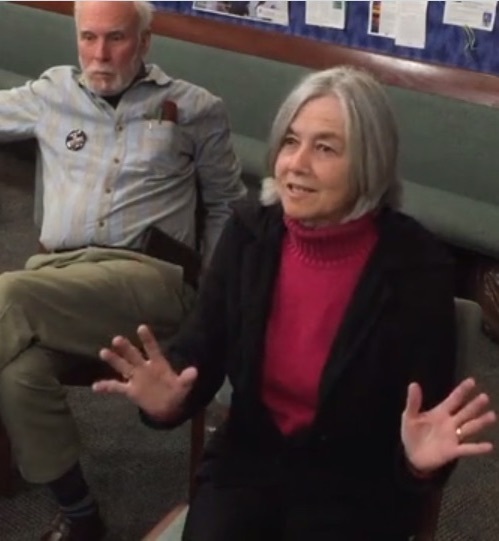 Haley Pedersen of Code Pink, speaking at an earlier “Exposing Militarism” event, in Berkeley. He also noted that the Pentagon, with its 6,000 military installations all around the United States and another 5,000 in other countries, is exempt from the emissions regulations applied to all other forms of enterprise in the United States. The Paris Climate Agreement would, he said, have required removal of this exemption. He speculated that that added to the inclination of the military-industrial complex to support President Trump’s exit from the Paris Agreement. He referred to the high costs involved in dealing with the aftermath of the extreme weather events the United States has experienced thus far this year, concluding that climate change is a force far more destructive of human life than the global terrorism that has been identified as the major threat the U.S. military is now confronting. After Smith’s talk, attendees engaged in a lively discussion of several related issues, including how these facts can be brought home to younger people. This participant also noted that next September, California Gov. Jerry Brown will be convening a “Climate Change Summit”, and that antiwar activists should continue to try to get their slice of the climate-threat problem onto the agenda there. In his summary remarks, Smith noted that the contribution that war and militarism make to climate change is the “elephant in the room” that needs to be addressed. In a reference to the publicity that climate-change activists have given to the contribution of cow flatulence to global CO2 levels, he asked whether “War Farts”– that is the CO2 emissions from the military– could also become a thing.